Commonly with two to four ascending stems from a single rootstock. Basal leaves often several, long petioled with ovate to reniform blades, smooth except for minute pubescence on the upper part of the stem and on the lower leaf surfaces along the veins; the stems bearing one to three short-petioled leaves, each broadly ovate, slightly heart-shaped at the base and long pointed at the apex, the uppermost ones smaller and nearly sessile. Flowers in the upper axils, yellow, the lateral petals bearded. Fruiting capsules ovoid, woolly white or rarely nearly smooth; seeds brown. In low, open, moist woods, Nova Scotia to Manitoba, south to Georgia and Texas. Flowering in May and June. 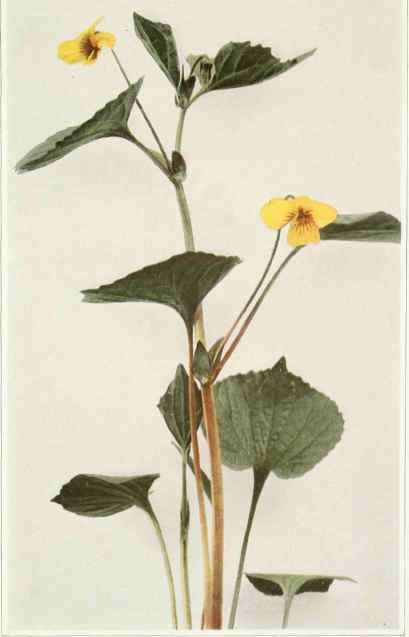 The closely related Hairy or Downy Yellow Violet (Viola pubescens Aiton) is softly pubescent throughout; stems usually but one from a rootstock; usually without basal leaves, but bearing one to three leaves on the stem, which are broadly ovate or reniform. In dry, rich woods, Nova Scotia to Dakota, south to Virginia and Missouri.